With UPilot, you can manage your day-to-day tasks and get reminders for when a particular task is due. This will ensure that your deals or prospects slip through the cracks! You can create tasks for yourself or delegate them to another team member. 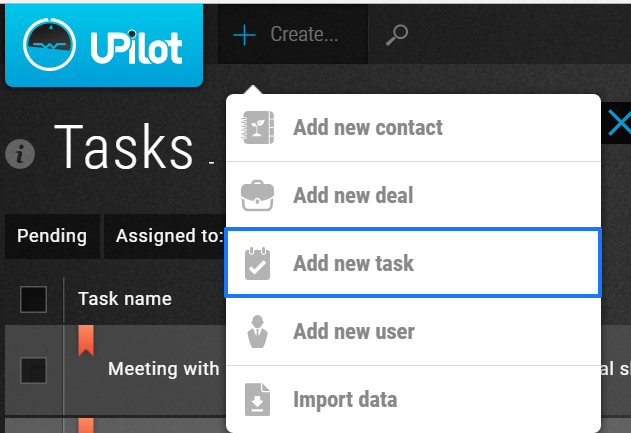 Click the (+) icon on the top-left of the page and select ‘Add new task’. Set the Date and Time when the task is due. Set the required Reminders (By default both in-app as well as Email reminders are ON). Click on Show all fields to assign the related contact, deal, person responsible etc. Click on Create task on the bottom right. Your task has now been created. While creating the task, you can also delegate it to another person by changing the ‘Responsible’ field under ‘Show all fields’.